"X" planes at Miramar. USNTPS asset procurement # X0117. This class is taking place today at 1930 hours SLT. Tomorrow starts the NAAR 02 cycle, you will need this class to attend. Catch up NAAR 01 classes available by schedule for this series first run - minimum of three attendees required for catch up classes. Attendees: USNSL pilots, aircrews and ATC personnel, NSTC students. Follow up: NAAR 02 and NAAR 03 classes and evaluation in action. Click on the image to go to the U.S.N.S.L. acronyms page, now available in the Special Sections, on the right column. 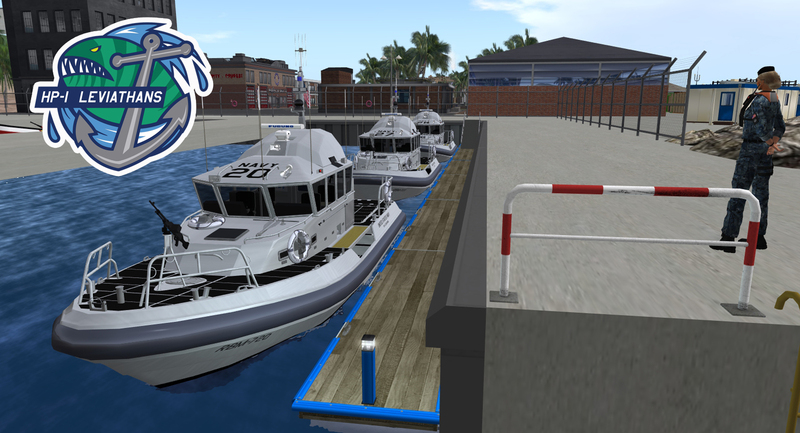 This class is taking place today at 1400 hours SLT. NH Industries MH-90 NFH Block 17 NH, CD-030, BuNo 17012, from HSC-14, Chargers, stationed at N.A.S. Velinissimo. The 030 was the first MH-90 NFH delivered to NASV and is flown by NASVCO LCDR. Chrissy “Steady” Dehner. 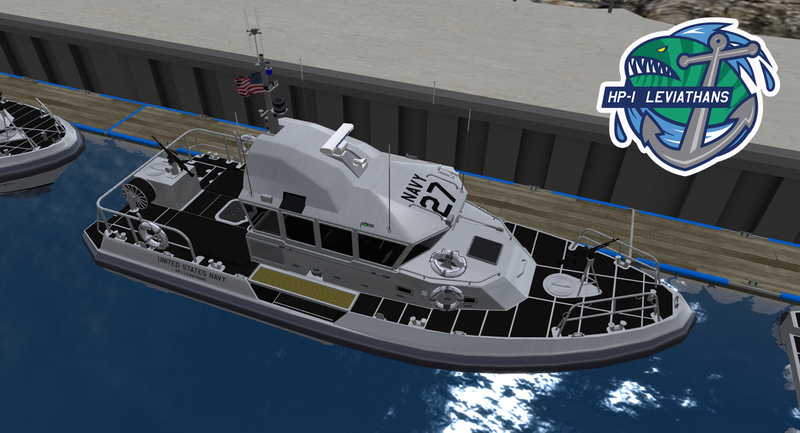 This model provides SAR and additional patrol capabilities to the Chargers, enhancing these roles in the central north area of Nautilus, since N.A.S. Velinissimo is located within Naval Service Training Command Nautilus. AW-139 DM. 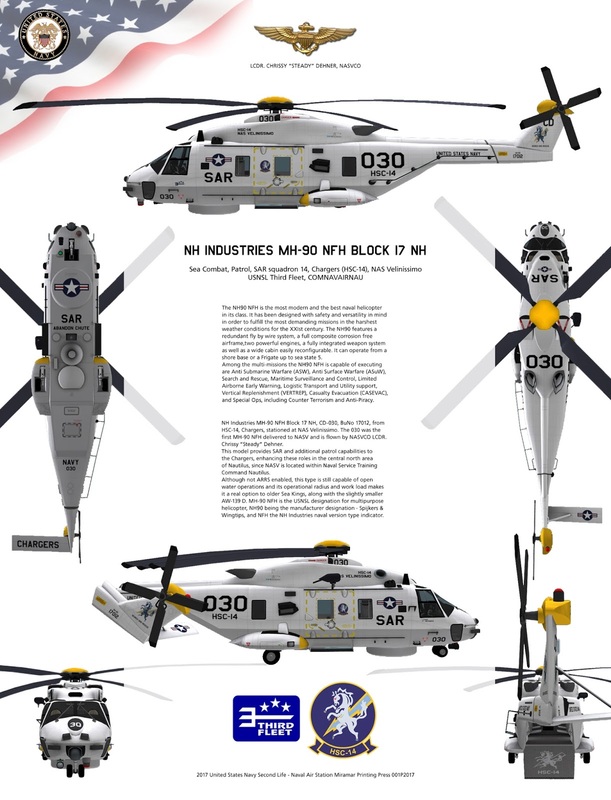 MH-90 NFH is the U.S.N.S.L. designation for multipurpose helicopter, NH90 being the SL manufacturer designation - Spijkers & Wingtips, and NFH the real life manufacturer naval version type indicator - NH Industries. The NH90 NFH is the most modern and the best naval helicopter in its class. It has been designed with safety and versatility in mind in order to fulfill the most demanding missions in the harshest weather conditions for the XXIst century. The NH90 features a redundant fly by wire system, a full composite corrosion free airframe,two powerful engines, a fully integrated weapon system as well as a wide cabin easily reconfigurable. It can operate from a shore base or a Frigate up to sea state 5. Among the multi-missions the NH90 NFH is capable of executing are Anti Submarine Warfare (ASW), Anti Surface Warfare (ASuW), Search and Rescue, Maritime Surveillance and Control, Limited Airborne Early Warning, Logistic Transport and Utility support, Vertical Replenishment (VERTREP), Casualty Evacuation (CASEVAC), and Special Ops, including Counter Terrorism and Anti-Piracy. 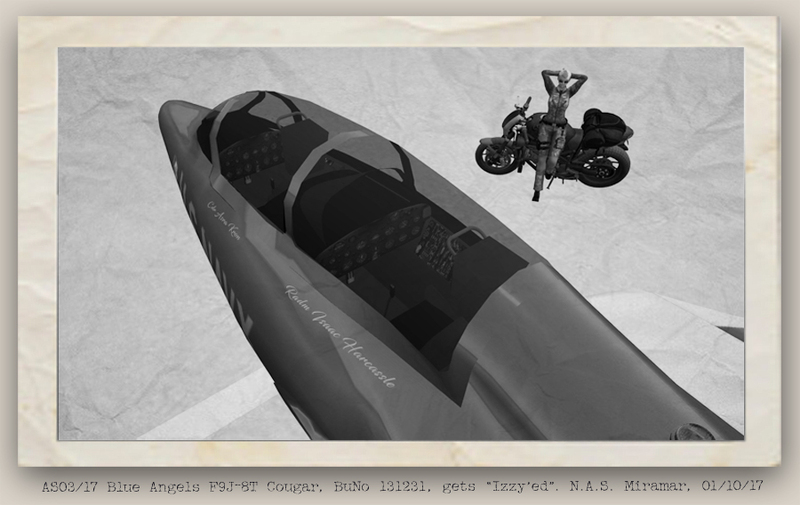 The aircraft shown on the print, BuNo 17012, was delivered to N.A.S. Velinissimo on February 21, 2017, and is the second of her type delivered to U.S.N.S.L. Third Fleet units, the other being assigned to HSC-22, Sea Knights, BuNo 17006, assigned to the USS Nimitz, CSG 11, stationed at N.A.S. Miramar when ashore. HSC-14 NH-90 CD-030, BuNo 17012 on delivery flight to N.A.S.V., escorted by HSC-22 AJ-089, BuNo 17006. 02/21/2017. Following Third Fleet Directive 01/12/2017 a long due orders method explanation is set here for future reference by all U.S.N.S.L. Third Fleet installation, carrier and aircraft carrying vessel commanding officers. Remember that "all new squadrons and surface units need to be proposed to Third Fleet Command prior to establishment" (*) prior to any vehicles being ordered for them. See Third Fleet Directive 01/12/2017 here. 1. The order and BuNo or Hull Number. An "order" is considered made when a location of deployment CO decides to add an aircraft, ship or boat to his/her command. That decision usually comes when a new aviator or ship/boat captain is deployed at his/her location, but also when there is an opportunity for a resident officer to add a vehicle to the local roster. The "order" is then placed to Fleet Command. Note: If you are a CO of an aircraft carrying vessel stationed at a N.A.S., N.A.F., N.B. or N.R.S. (ex: Dauntless Class Frigate) and you have a new order, you need to place it via your location of deployment CO. Aircraft Carrier CO's are usually autonomous and considered location of deployment CO's (ex. USS Nimitz - CAPT. Alex Juventa CAG), even if deployed from a Naval Base or Naval Air facility. The CO registers the vehicle with Third Fleet records, located and organized at N.A.S. Miramar. The registry info specifies the squadron or unit the vehicle will join, type and role of the vehicle, the crew and its position in the squadron and any changes to that squadron's composition. The registry will generate a BuNo/Hull Number and provide guidelines for the types of liveries available, designer in charge and possible side numbers (SDN). Note that existing models will prevail, no matter who the designer is. If a particular squadron has a designer working on its liveries, that designer must be contacted to supply any similar ones. That does not exclude any designer from following Third Fleet standards and submitting the work for inspection before application. A new arrival is always reason to celebrate. Whenever the work on a new aircraft or surface vessel is complete, CO's are encouraged to register the occasion and advertise it on their local platforms (location websites or weblogs) and/or send the report to Third Fleet command for publication in the U.S.N.S.L. Third Fleet website. As the main source of Third Fleet new aircraft and surface vessels deliveries, expect N.A.S. Miramar to echo those good news on its own platforms (group, weblog). The advertising of those reports (links) in U.S.N.S.L. group notices and/or chat is also encouraged, as it presents an opportunity to show Third Fleet's dynamics and activity. Please direct any questions on this matter to RADM. Isaac Harcassle or CDR. Asra Kron. This class is taking place today at 1700 hours. HP-1 new RBM-45's delivered at Naval Base North Valley's docks, still under construction. Following a batch order by Third Fleet command to N.A.S. Miramar central registry, new Tiger Class RBM-45 patrol boats started being delivered to Naval Base North Valley, at the base new location in Gorlanova, northern Satori coast, southeast of the Bingo Strait. 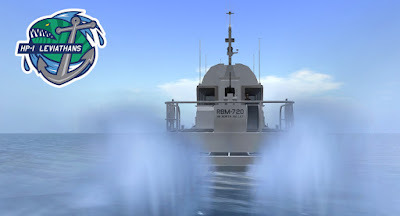 The order will add seven new RBM-45's to the existing two that will transfer from Naval Air Facility Avignon in the end of the month of February, where they will form the new HP-1 Leviathans patrol boat unit. Delivered are hulls nos. RBM-720, 727 and 728. The 20's spray at 70% power south of Nautilus City. 02/19/2017. Classic 27 displays its unique large panel aft deck at NBNV. 02/19/2017. LCDR. D. Harcassle's 20 leads the dock line at NBNV. 02/19/2017. More to follow on both surface vessels and aircraft deliveries and transfers now that we come closer to the merge of N.A.F. Avignon units into the Naval base North Valley HUB - Naval Base North Valley (NBNV) and Naval Air Facility Gorlanova (NAFGO). Click the image to go the Squadrons page. Following Third Fleet Unit Livery and Sequential Standard Directive, a.k.a. Directive 01/12/2017, the squadrons in Third Fleet are now available for quick consult. 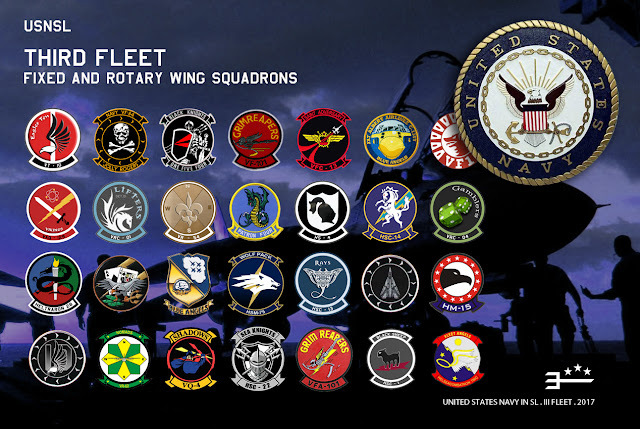 Please follow the link above and at any time, access the page by choosing "Squadrons of the III Fleet" on the right column under "Special Sections". This will be Third Fleet's reference both internally and externally - the simple tool that will help us see the fleet with a broad but exact glance, from candidates trying to determine where to deploy to officers from other Navy groups in U.S.N.S.L., and as a quick and accurate way of introducing ourselves as part of Third Fleet. Save the page URL for future reference (also here!). If your location has not submitted information on this matter or you find it incomplete or inaccurate, please contact me at your convenience. Thank you. CDR. Kron, Ms. Fairport, LCDR. Kaz, LT. Five, CDR. Kuhn, ENS. O'Mara, Ms. Denver and Mona at Cougar's, 02/02/2017. This is an open letter to all in Third Fleet, but may apply actually to all in U.S.N.S.L. and it is about who we are as people, as individuals, as friends, as officers or enlisted, as fellow Navy service men and women. You all should know by now how I take my role in this United States Navy in Second Life and how important it is to me to show respect for the real life institution we mirror and honor those who serve in it. I take it to heart and do my best to uphold standards that reflect that respect and keep with the huge responsibility that is to portray the United States Navy. Having said that, we are all human on the other side of the screen, and we all have different ideas and points of view and feelings. But just as when you join something bigger than you in real life, here as well you place the good of the group before your own and you try and try again to make things work, no matter how hard they seem or how hopeless they may look. You just owe it to everyone in the group to do so. Because we all also, in time, become closer, and many times friends. As in real life, there is a line between professionalism and friendship that can not be ignored, that must be observed and that should never be crossed. The closer we get to someone in the service the thinner that line becomes and the higher the expectations about keeping our actions professional while preserving the friendship. Such is the nature of the job. And we all know it. Or should. There are times when we look after each other and times we need to let each other walk their path, because we are in the end U.S.N.S.L. service members and there are consequences to our actions when dealing with matters that should be private. Some we need to address head on, those referring to relations between service members, as it is our duty to do so. Some we need to let go, those of a more private nature, concerning relations between service members and others in the civilian world. Some are easy to deal with, when the ties connecting the parties involved are not equal in strength. Some are harder to manage, when family is involved. In the end, it all comes to common sense and the sense of dignity we each have, in various degrees. But to a senior officer in command, be it of a squadron, a platoon, a ship, an aircraft or a station, the level of sensibility and patience expected are as high as the position they fill. The higher the position, the higher the responsibility. At some point, however, there is the need to let go. After all is said and done, after all chances were given and all venues explored, sometimes you need to let someone else take your place and find ways to work around a problem and reach a solution. That is part of the process and it allows us to leave no woman or man behind without doing all we can to work things out. It is who we are. It is what we do. In the end, it is up to each of us, as individuals, to allow this process to take place and give our best to make it work. Some achieve this goal. Some do not. Some choose to take some time away and wisely consider options and reflect on things past, while others... Well. Others choose to burn the bridges we try to build for us all. When that happens, it is always with a heavy heart we watch the flames going up, in spite of all our efforts. It happens. It is not the end of the world. Rest assured your CO's are trained and taught to help you in your careers and provide you with the guidance and the skills that will allow you to be a better naval officer or enlisted and a better person as well. But know also that your CO is not your papa and not your mama. We are all big boys and big girls. We do not expect from one another to become men and women in the Navy, but indeed are expected to become better men and women. Wen we arrive, we are expected to be grown ups on day one. Remember that. To all Third Fleet personnel, their families and friends, my best regards. 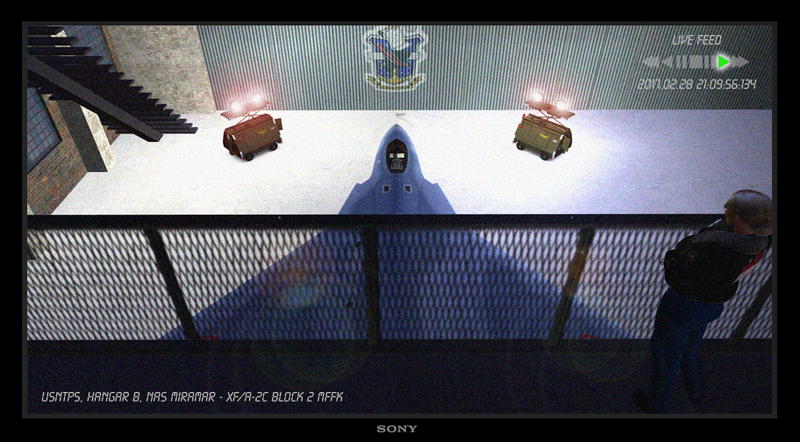 We are United States Navy in Second Life. And should always be damn proud of it. The Little Fatso over Blake. Crew wanted! 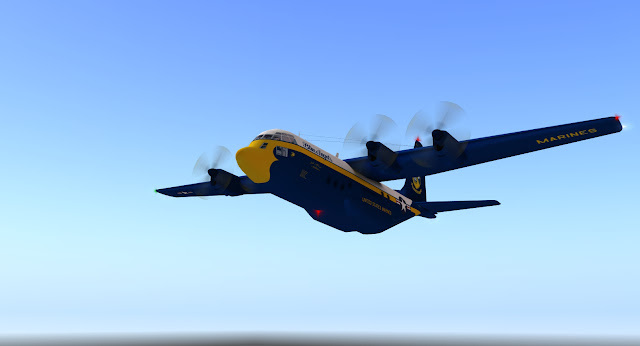 Welcome to Fat Albert Airlines! The Navy Flight Demonstration Team, part of U.S.N.S.L. Third Fleet, is yet to complete the USMC component that both makes for the Fat Albert crew and the team's ground crew. Both roles are essential, in a complementary but important way, for the full display of the team's routines, in the air and on the ground. Fat Albert, the team's C-130 Hercules support airplane, is a USMC aircraft with a crew of 8; pilots are USMC aviators, remaining crew is composed of USMC and USN enlisted. "Fat Albert" is a nickname given to the plane by Marine Corps Blue Angel pilots in the 1970s because of its size and shape. It is a reference to the popular children's cartoon of the same era. In real life there are 13 Marines on the 2017 team. There are three C-130 pilots and four enlisted aircrew in Fat Albert Airlines. There are six enlisted on the jet maintenance team. For 2017, seven Marines are assigned to operate Fat Albert Airlines: three pilots, two crew masters and two flight engineers. In second life we are aiming to fill all those positions as well. The U.S.N.S.L. Blue Angels favor deployments where the team members stay with their original units/squadrons - this means that if you are active duty you will remain with your unit/squadron, and practice/perform with the Blue Angels as well. Full time deployments (transfers) are a possibility. Partial OR full time deployments must be approved by U.S.N.S.L. chains of command (origin and destination). 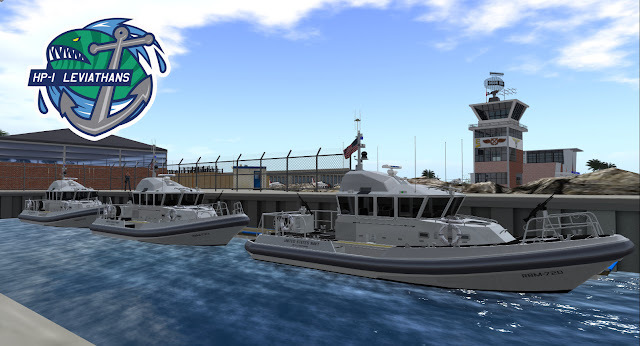 The few, the proud, the Navy Flight Demonstration Team United States Marines in SL. Be one. 1. To be a member of a Second Life USMC unit. 2. To be a certified USMC naval aviator for the C-130 pilots/co-pilots positions. 3. To be a certified AWO (Naval Aircrewmen Operator) for the C-130 crew master positions. 4. To be a certified AWO (Naval Aircrewmen Operator) for the C-130 flight engineer positions. 5. 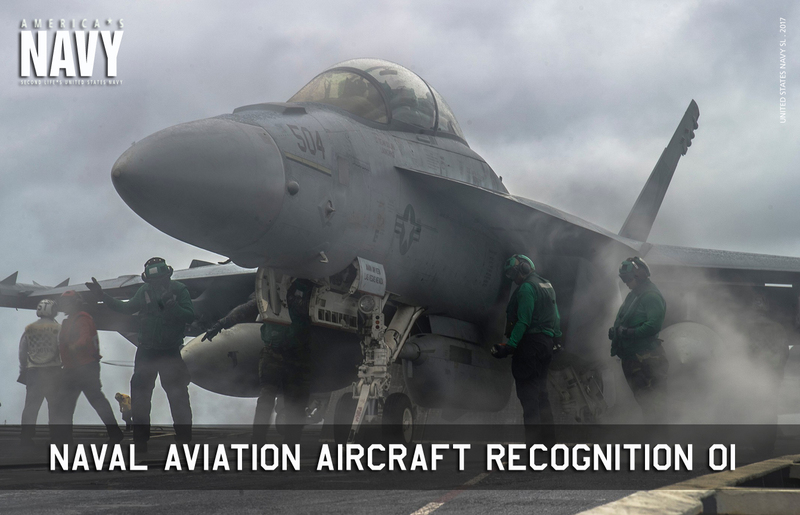 To be a certified AWO (Naval Aircrewmen Operator) for the jet ground crew positions. 6. 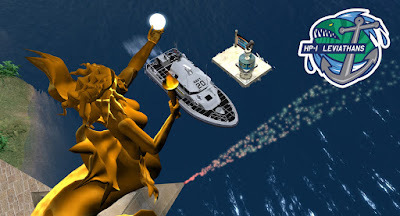 To have an OCS/RTC certificate recognized by the Naval Service Training Center (NSTC) Nautilus - Third Fleet, U.S.N.S.L. 7. To have deployment and/or transfer orders signed by their unit's CO.
9. To pledge to a full Season with the N.F.D.T. - Seasons start January and end December. 10. To maintain the level of commitment, professionalism and responsibility that are standards of the U.S.N.S.L. ambassador squadron: The Blue Angels. 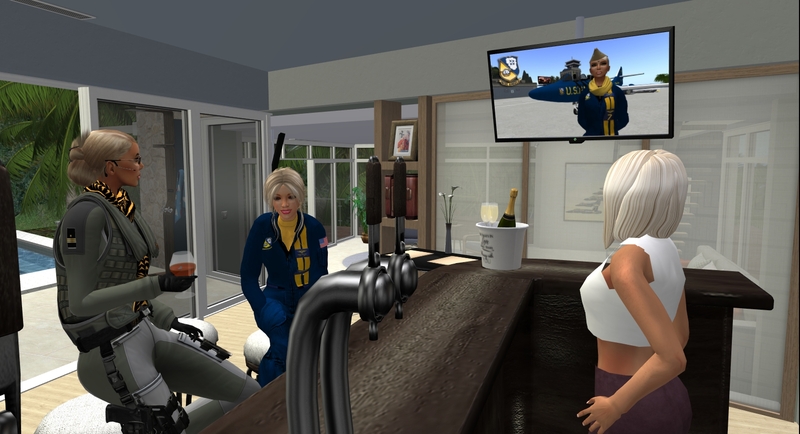 Each member of the Blue Angels in SL is vetted by their squadron fellows. In the jet team the process is one of unanimity - if even one aviator in the jet team opposes the candidate after the on boarding period he/she is not allowed in. With the C-130 crew, the process is similar regarding Fat Albert naval aviators. After their selection, these officers will start that tradition within Fat Albert Airlines, however, the Squadron CO will always have last word on enlisted to be deployed with the team, coming from the USMC or the USN alike. See more about the U.S.N.S.L. Blue Angels here! For details and application, please contact the N.F.D.T. Blue Angels CO or XO. These are the security protocols to be followed and used against anyone not willing to follow NASM rules, engaging on disruptive activities or not observing Navy procedures. A1 - If a Third Fleet officer is not wearing his group tag - THIRD FLEET or NASM - they are considered OFF DUTY even if in uniform - a USNSL tag is NOT an official tag recognized by Third Fleet as identification of an on duty officer. A2 - The security protocols apply same as with everyone else and are applied according to the disruption level. B1 - Same A-1 rule applies but considering the groups they belong to. As there are many groups, look for a USNSL tag or a Navy related tag (example: SLMC). If they are not wearing any they are considered OFF DUTY. B2 - Same as A2. Navy protocol refers to any and all Military Conduct infraction. In case a USNSL ON DUTY officer disrespects procedure make a note of the incident and report it in writing to your CO, including any pictures or transcripts. Station protocol refers to local rules - applies to Navy Personnel and Civilian alike. Warn the subject about the infraction and explain the correct procedure. Hand out the respective NAVY or GRID ATC note cards or links to these on NAS Miramar's weblog and also the NASM Map "NASM Runways ATC Guide ((DATE))" (make sure you have the last update of these reference materials). Report the incident in writing to NASM Command. No further action is required. Third Fleet personnel will be placed immediately on a 60 secs Fly By / Sail By status in the security system, and the incident will be filed in a report to NASM Command for further action if needed. Disciplinary action will follow through Third Fleet channels. Third Fleet personnel will be placed immediately on a 60 secs Fly By / Sail By status in the security system, and the incident will be filed in a report to NASM Command for further action. Disciplinary action will follow through Third Fleet channels. USNSL personnel outside Third Fleet may file a redress request with NASM Command after enforcement of these measures. ANYONE caught griefing the region will be placed immediately on a 60 secs Fly By / Sail By status in the security system, and the incident will be filed in a report to NASM Command. ALSO and immediately the incident must be reported to a region manager - CDR. Asra Kron, MCPO Margot Fenring or any Surreal Estates manager - for immediate action (as soon as they are available). The subject will be placed at once in a permanent region ban and reported to ALL USNSL for similar action to take place at other locations. In the Tuarua Fiji estate, a subject caught griefing one region is permanently banned from all other regions. There is no redress given to a UNSNSL member who is caught griefing. (**) Notes: The abuse of this privilege will be dealt with swiftly and without mercy. Follow procedure. ATC officers will only act on emergencies if not on duty. They require a senior officer for further actions. When in doubt - ASK FIRST. No actions are to be taken without a clear notion of the infraction and these protocols. From left, Mona and Barbara at Cougar's with the brand new Blue Angels Signature ball cap, 01/31/2017. If you have been to Cougar's Sore Bottom Sailing Club, N.A.S. Miramar clubhouse, you know the mean cocktails Mona mixes. Usually by the bar on the ground floor but occasionally seen by the pools terrace when the occasion calls for it, Mona is always ready to take your order and to refill your glass as soon as it gets empty, if you so desire - this alone tells you best times at Cougar's are off duty. Hard to resist Mona's spiked mixes, though she has been known to serve an occasional soda and even fruit juice! Mona doesn't talk much, but some have had long conversations with her after a few of her Tequila shots, and given some more some have even been caught in the act of blatantly making passes at her! It's the "Mona effect". She's a bartender with an attitude. Some Chiefs even tried making "dancing" passes at her. Cougar's, 04/24/2016. Well Mona has a twin, Barbara. The officers who have been in the U.S.N.S.L. long enough may remember her from the sorely missed Deder House, N.A.S. Miramar's officers club on Deder Isle, where N.A.S.M. East once stood. Since the closing of the East section of Miramar, Barbara was out of a job, but despite all the passes made at her Mona was feeling lonely and no one understands her better than Barb. So she was hired again! Mona and Barb, the attitude twins, are back and if you like Mona's cocktails you'll be glad to know Barbara can cook a Hotel Sierra barbecue. When she is not at Cougar's you will find her on the Map Room lawn, in the break area, where the barbecue outdoor grill is. If you get confused, just look at their name plates. You may need to focus after they hit you a few times, they are twins after all. So come by and say hello to the girls. You won't regret it.